It’s summertime, and you’re looking for any excuse to get on a boat. Booze cruise, sunset sail, or fishing charter, a day at sea is liberating for sure -- until you get seasick and liberate the contents of your stomach over the rail. When I got seasick as hell, I thought death was the only cure. Only lately, when I met the legendary Jean-Michel Cousteau, was I convinced otherwise. I was giddy to meet the guy, having declared as I kid that I’d one day become a marine biologist (it never happened), inspired by reruns of his father’s TV program from the ‘70s: The Undersea World of Jacques Cousteau. Jacques Cousteau, forever nicknamed The Captain, invented the Aqua-Lung during WWII -- the origins of scuba diving as we know it. Perpetually capped by an iconic red beanie, the inspiration for Wes Anderson’s eccentric Steve Zissou in The Life Aquatic, he embodied an intrinsic curiosity for the underwater universe. Whether in command of his famed exploration ship, the Calypso, or producing dozens of documentaries, including multiple Oscar-winners, Jacques Cousteau exposed us landwalkers to what lies beneath the surface, an alien environment with which we are forever entwined, and unquestionably dependent upon, for life on earth. Now, just imagine what it was like growing up as that man’s kid. 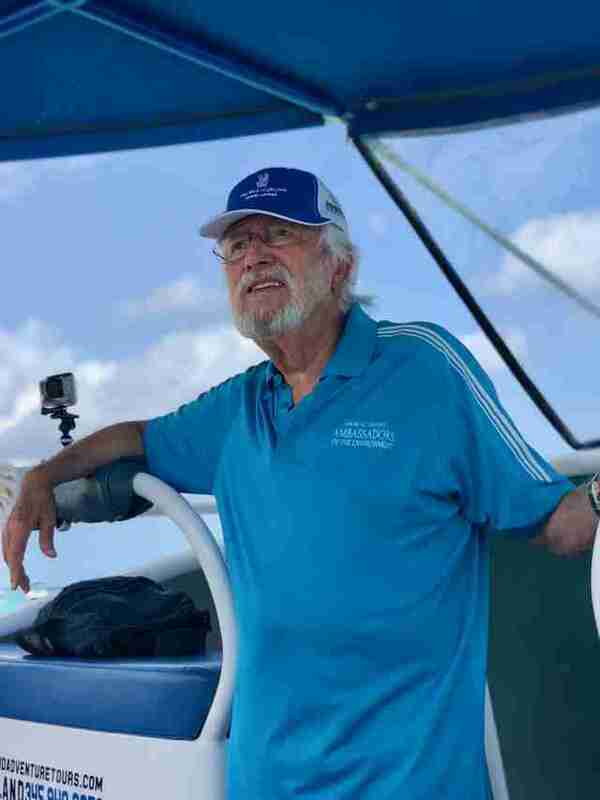 “He threw me overboard at the age of 7 with just a tank on my back,” Jean-Michel Cousteau tells me in the Cayman Island outpost of his Ambassadors of the Environment program. I had zipped down to the Caribbean to learn more about JMC’s global education initiative on ocean conservation. By partnering with select Ritz-Carlton properties, Cousteau’s team can gently encourage affluent guests to return home with a love for ocean life, even when they’re surrounded by concrete. It’s naïve to think JMC simply followed in his father’s footsteps. He’s got even more years (over 70) of ocean exploration under his belt, during which he’s produced more than 80 films (winning an Emmy, a Peabody, and the Sept d’Or along the way), and founded his immensely respected Ocean Futures Society. While his father was a late-blooming environmentalist, conservation has always animated JMC: He even convinced George W. Bush to declare a 1,200-mile chain of Hawaiian islands a Marine National Monument, which in 2006, was the world’s largest marine protected area. All of that’s wonderful. 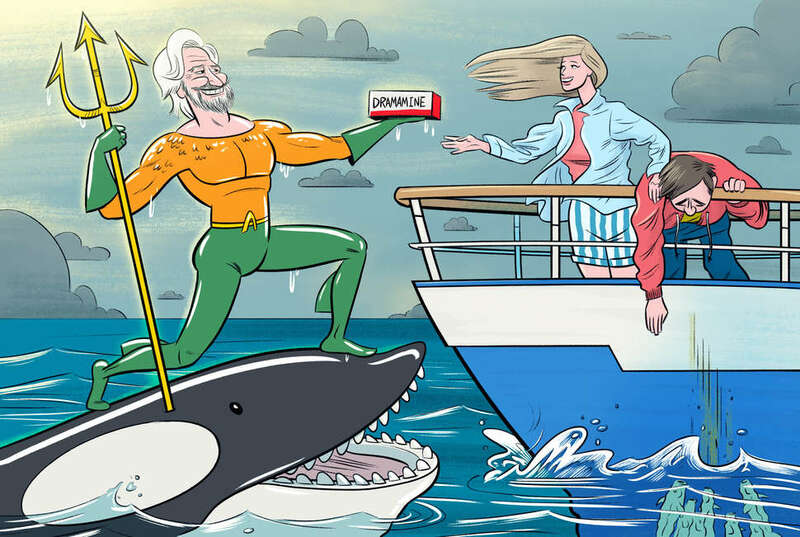 But when I sat down with this living Aquaman, I really just wanted to know -- on your behalf, dear reader -- how to keep from barfing my ever-loving guts out the next time I’m at sea. Here’s what the dude told me. In more than three-quarters of a century traversing the oceans, Monsieur Cousteau doesn’t recall ever getting seasick himself. I wasn’t surprised, considering his saltwater upbringing. Still, he’s seen plenty of it from passengers on his expeditions. “It happens with others, of course,” he said, magnanimously. The Scopolamine patch is celebrated for providing three-day relief, making it the best option for longer voyages, though it requires a prescription. Others swear by the Sea-Band, a natural method that uses acupressure for nausea relief through a tight-fit reusable wristband. You avoid the potential side effects from taking drugs, but it might be less effective. Whatever treatment you choose, the universal piece advice for seasickness prevention is to stay sober. Booze/pot messes with your equilibrium on land (ever had the spins? ), and they’ll definitely not help you on an oscillating surface. Seasickness is unpredictable, so what do you do when it hits? “Avoid the bow,” he says, referring to the front of the ship, “but the worst thing to do is hide in the gally, where you’re in a torture chamber.” Whatever you do, don’t go below decks to wait it out. Remember that tension between what your ear feels and what your eyes see? It only gets worse when you’re in an enclosed room. “We see people coming out green in the face,” Cousteau tells me. “They’ll feel better if they just feed the fish.” I interpreted that literally for a second, until I realized it was nautical-speak for throwing up over the side of the boat.